Carved Masks are an important artistic tradition among the nations of northeastern Everique, where they play a number of roles in the culture. In addition to being beautiful works of art, the carved masks carry a great deal of symbolism. The natives often adopt symbolic roles in their ceremonies, government, and formal interactions. When a mortal is acting in the role of a spirit, the mask transforms the individual to the mythic entity. 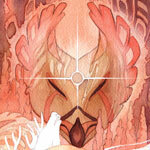 Carved masks also act as the focal point for manitou when dealing with the mortal world. Spirit dancers wear masks to forge a bond between themselves and their affiliated spirit. Masks that are tied to a spirit are carved from living wood. The mask is not cut from the tree until it has has been fully carved. Some are decorated with cornsilk hair, but horsehair is becoming more common with the introduction of the horse to Everique. They are vividly painted with colors that reflect the elements associated with the spirit tied to the mask. Masks that are tied to spirits are symbolically fed mushed maize and tobacco smoke. Masks that have no spiritual connection do not need to be carved from living wood or fed.